Archer on Airguns: 1,000fps. The Muzzle Velocity Myth. 1,000fps. The Muzzle Velocity Myth. Many air rifle owners are convinced that they need 1,000fps muzzle velocity - or more! - for their new air rifle. They also believe that higher muzzle velocity means more "power". I understand this. It's a natural result of the almost-irresistible marketing pressure by some of the biggest manufacturers in the airgun business to sell their products based on higher and higher claimed muzzle velocities. But is this true? And what does 1,000fps (or any other specific muzzle velocity) mean? Well, for many types of shooting, muzzle velocity means very little unless the weight of the pellet is also associated with it. For example, everyone intuitively understands that a heavy iron cannonball moving at, say, 20 MPH will cause infinitely more damage when it hits an object than, say, a very light table tennis (ping pong) ball moving at the same speed. That's because the hitting effect of both balls is a product of both their speed (= muzzle velocity) and weight. If the speed is the same, the cannonball hits harder because it's heavier. This hitting effect is called "muzzle energy". In airgun terms, this means that muzzle energy is really the defining requirement - particularly if you are hunting - rather than simple muzzle velocity. 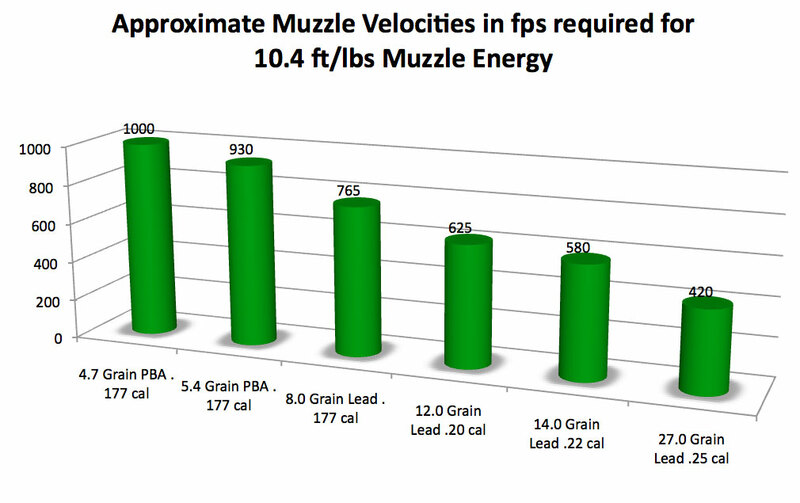 The chart above shows the muzzle velocities that are required by different weight pellets to achieve a muzzle energy of 10.4 ft/lbs. (You can click the chart to enlarge). As you can see, a very light 4.7 Grain PBA pellet traveling at 1000fps has a muzzle energy of about 10.4 ft/lbs. 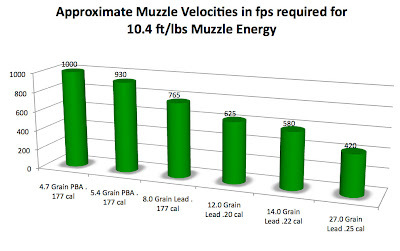 But an 8.0 Grain .177 caliber lead pellet fired at only 765fps actually has the same muzzle energy of 10.4 ft/lbs. And a 27 Grain pellet in .25 caliber only has to crawl along at 420 fps to have the same hitting effect. So, a muzzle velocity of 1,000fps gives no real information about the power of the air rifle unless the pellet weight is also understood. This is why we show Muzzle Energy information for all of the air rifles in our ArcherPelletGuns store, together with a hunting recommendation that's based on the real "knock down" power of the air rifle and not just it's muzzle velocity. This is why muzzle velocity alone is not the whole story on air rifle "power". Very high muzzle velocities attained by very light pellets often give less muzzle energy (="power") than a heavier pellet traveling slower. That's why .22 - or better still .25 caliber - is almost always a better and more humane choice for air rifle hunting than .177 caliber. Thanks Stephen, even I understand that. Do you do any distribution in Ireland? Cliff Bond. Cliff, we don't have distribution in Ireland at present, but we're looking for international re-sellers for our Archer Airguns parts and accessories around the World. It seemed to indicate that higher velocities were hitting harder. I have always been told exactly what you are saying here, that the mass of the object can dramatically increase FPE. So why were my results showing such a strong correlation between velocity and FPE? Is there some variable that I'm missing? But this type of performance is very untypical of the vast majority of air rifles that I've tested. This post pretty much resolves my earlier question; eventually, the mass of an object wins out when it comes to FPE. Choose Your Own QB78 Mounted Scope Combo!